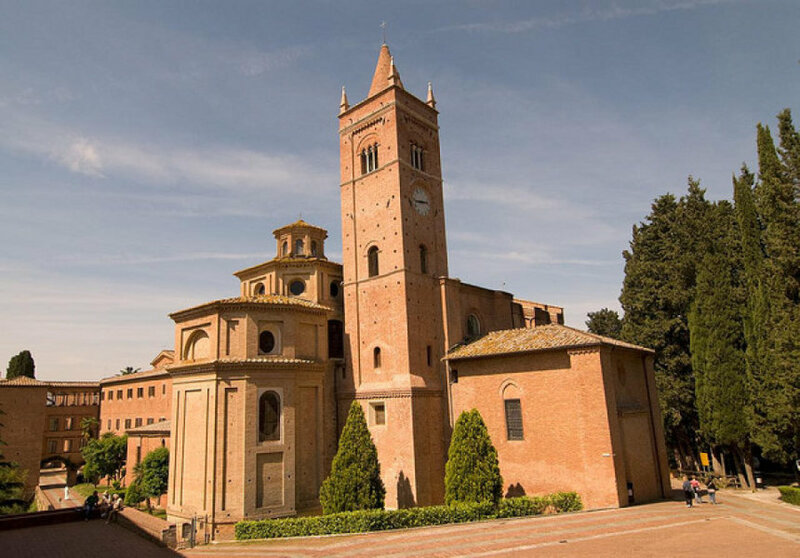 The Abbey of Monte Oliveto Maggiore, a superb art monument, rises on a solitary height clad in cypresses in the province of Siena, not far from the characteristic villages of Asciano, Buonconvento and San Giovanni d’Asso, and approx. 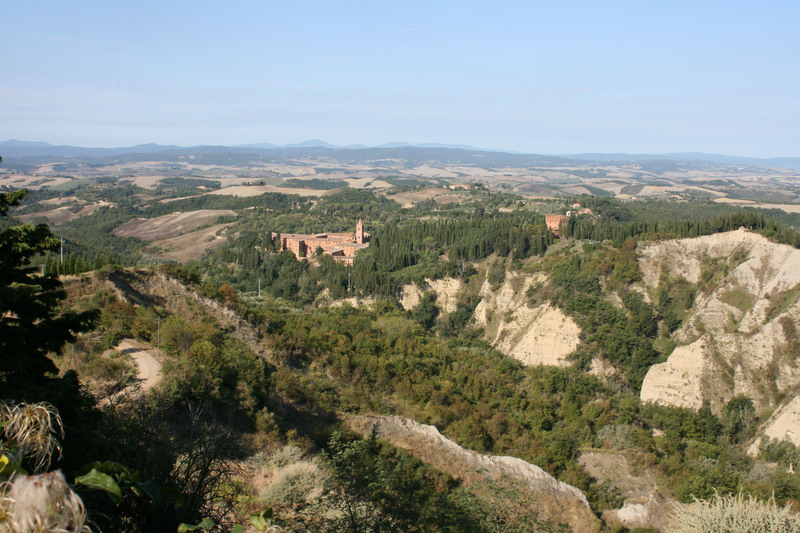 40 km away from Siena city center. In the background the famous “Crete” (typical sand and clay formations), the Ombrone Valley and Mount Amiata. 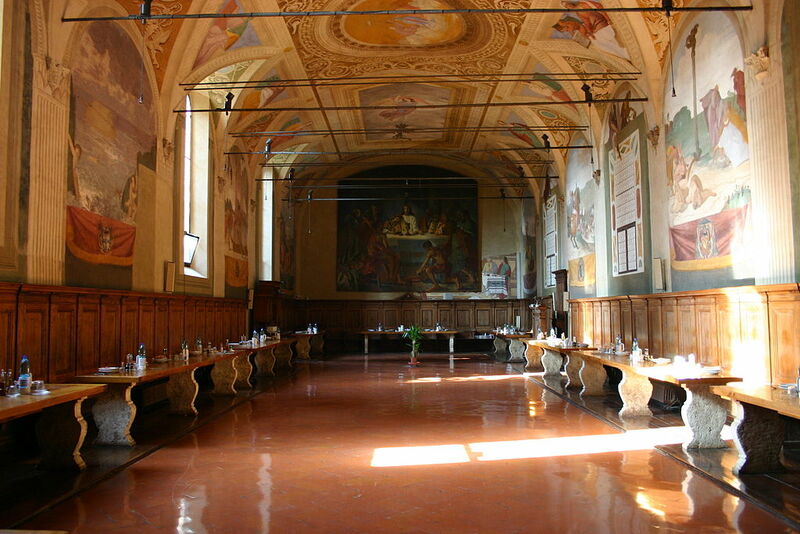 Founded by the Sienese Bernardo Tolomei in 1313, the Abbey is now a complex of buildings constructed over the XIV-XVIII C., preceded by a small medieval palace with a massive rectangular tower with battlements and drawbridge, built in 1393 to defend the monastery, which was completed in 1526 and again restored in 800. 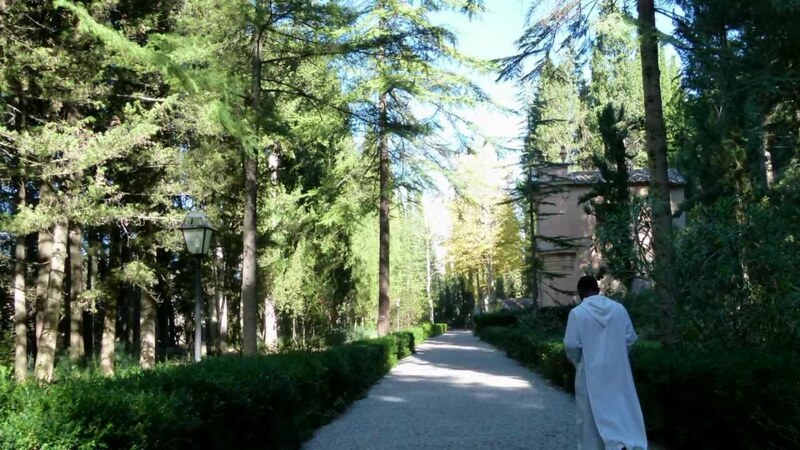 From the bridge you enter an avenue running downhill in the midst of tall cypress trees which leads to the Monastery, it surpasses a fish pond built in 1533 to provide the friars with fish in periods of abstinence from meat. At the end of the avenue the imposing Abbey complex on which stands the Romanesque-Gothic bell tower 47 meters high. 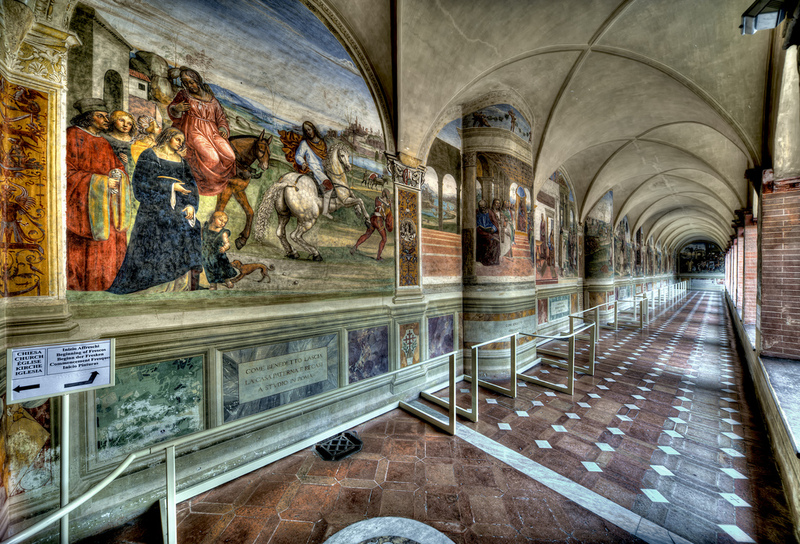 Through an entrance hall the great cloister is reached, whose walls are adorned with one of the masterpieces of the Renaissance art, the cycle of frescoes of the Life of Saint Benedict by Luca Signorelli and Sodoma, narrating the life and deeds of Saint Benedict as recounted by San Gregorio. The Church has a Gothic façade with an elegant portal, inside there is a magnificent wooden choir by Fra Giovanni da Verona (1503), proving the technical and artistic skill reached by inlayers of Monte Oliveto. 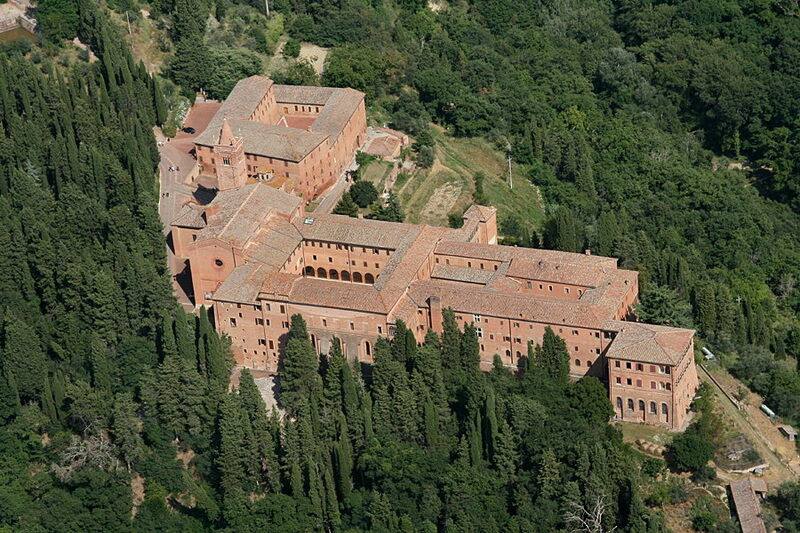 The enclosure area consists of the middle cloister, the refectory, the small cloister, the library with 40,000 volumes, the Definitorio (or Chapter-house) and a fine restoration laboratory for ancient books and parchments. Several tourists and devotees come today in Monte Oliveto, a place of prayer and worship, nestling in the heart of the Tuscan countryside, and where time seems to stand still forever. Choose a villa in the beautiful Sienese countryside of the “Crete”, visit our web site!!! [img src=http://www.holidayintuscany.it/wp-content/flagallery/monte-oliveto-maggiore/thumbs/thumbs_monteoliveto6crete.jpg]Monte Oliveto, the "Crete"